"Announcing: 2019's 'Fort Knox' eBook & PDF Security Protection... Relieving Your Fears of Stolen PDF Profits, Torrents, Book Sharing & Ugly Digital Crooks... Forever!" Book Guard Pro is a real-time, fully automated, state-of-the-art viewer, tracking & protection system for your valuable PDF, Video, MP3 (or any digital product) ...lock-down your digital products before and after they're downloaded from your site... for just pennies a day! Newsflash: Perfect PDF security solution for Adobe Acrobat 11 (and earlier) PDF's. Experience the LIVE EXAMPLE, right below on this web page! Book Guard Pro is NOT a simple password security system that requires an easily-broken 'code' for customers to access your product, or simply disguises your web site's download location. Not at all. Those outdated 'PDF password' methods (while slightly better than no security at all) do NOTHING to protect PDF files and prevent people from sharing your product (and password) after it's downloaded, or from continuing to use it, even after obtaining a refund! You deserve a pdf security system that is something much easier and stronger. And now it's here! We further guarantee our 'done-for-you' Advanced System works with; all Windows versions AND; Apple Mac, Apple iPad, Android and other mobile devices. It's ironic that what makes digital products so popular-unlimited duplicating, fast and easy availability via instant download or email-also makes them so easy to steal. Whether your product is a software application, ebook, report, audio file, video file, just a plain pdf document or other digital item, you'd be appalled to know how easy it is for some lowlife to steal it right out from under your nose! to download and test for FREE this protected PDF file I secured earlier today with BookGuardPro (simply save this file to a folder on your desktop). Next, double-click the .exe file you just downloaded. When asked by the program, enter the temporary Licence Code below, I'm giving you so you can see a very important, secret message in the PDF (I'm not joking ...you must know this insider info about PDFs ...if your business sells or deals in them in anyway. After download, you will see the BookGuardPro file open up when you click it. But there is no way you can save, edit or print the PDF inside. What's more, even though we are thousands of miles away from each other, I could remove your viewing access to this PDF in just seconds ...anytime I need to! You can have this same security system ...working for you in just minutes! Try this new document security in YOUR business today... because you'll boost your profits +avoid getting ripped-off by your customers, fraudsters and "tire-kickers" ! Sell YOUR Products... to Anyone THEY Want? They find your download page. Even if you're not naïve enough to name it something easy to guess, like www.yourwebsite.com/thankyoudownload.html, hackers are relentless and very talented! Without protection, both pro and amateur hackers will find your download pages and steal your valuable files! It doesn't matter that most of the people who take advantage of your vulnerable situation don't think of themselves as 'real' thieves. It doesn't matter that many of those who share unauthorized copies are doing so because they like your products so much - the products you work so hard to create. Have you heard of those fancy new high-tech security systems for cars? They can track the car's location, remotely unlock the doors, or even disable the engine if the car's been stolen! Wouldn't it be cool if you could rig your software program, ebook or other digital products with something like that? You can! Book Guard Pro uses a powerful technology called IP tracking. Every computer connected to the Internet can be identified by a unique string of numbers called an IP address. Book Guard Pro requires your buyers to "register" their new product before they receive a license code needed to access it. Don't worry, it's quick and easy so it's not a hassle for your customers! Plus you will get your comprehensive and effective pdf security. Take Control of Your Online Inventory. Protect PDF's, Digital Products, & Your Business with BookGuardPro! Works with all payment processing services -including ClickBank, Paypal, 2Checkout, PaySystems… even your individual merchant account! Protects any type of digital file -including .pdf, .exe. and software applications! As you can see, Book Guard Pro is much more than a simple file and security system! It is your silent partner that will protect PDF's while watching over your business's digital inventory-not just while it's on your "premises," but long after it's out the door and subject to more thieves and threats! 30 Day Trial for Only $2.87! For something so powerful and versatile, Book Guard Pro is incredibly simple to integrate with your website and products! Once you purchase and download your copy, installing and using it is an effortless click-and-go process! You'll have it up and running within 10 minutes! 1. 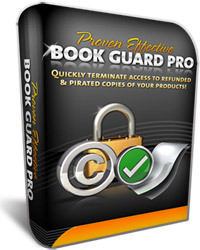 You purchase, download and install Book Guard Pro. 2. You use Book Guard Pro to modify your digital product file (to "lock" the file by requiring a license code before it will be accessible). 5. You check the usage statistics that are automatically monitored by Book Guard Pro. for your digital product protection needs! Your Very Own Team of Digital Guards, working for You 24 Hours a day ...Giving Total Peace of Mind! How Much Is That Worth to You? 30 Day Trial + Bonuses for Only $2.87! Is it worth it? Let's see how this PDF security program can help save you money. Say you are selling an ebook from your site for $37. Remember the statistics? 56% of users don't think there's anything wrong with sharing digital products they've paid for. So if you sell your ebook to 100 people this month, 56 of them may share it. Heck, let's be conservative and say only 50 of them share it with only one friend each-friends who might otherwise have purchased your ebook if it hadn't been given to them for free. That's 50 sales or $1,850 you've lost in one month! And that's not even counting the number of friends those friends will give your file to! Your losses grow exponentially! Not to be disrespectful, but you'd be absolutely crazy NOT to think Book Guard Pro is worth it! This is important: You must sign up and lock in the special introductory rate of only $2.87 for the first month, then just $17 per month to prevent paying more... when we raise the price. Once you've signed up, your monthly rate will never increase. So don't delay, order now! So you have nothing to lose, and so much money to keep in your pocket, by giving Book Guard Pro a try. P.P.S. Don't forget… every moment you delay, someone is ripping you off. Show those lousy thieves and freebie-seekers that you're not going to let them steal your products-and your profits-any more! Order this digital product Book Guard Pro now, sleep better tonight and earn more money from now on! ...then just $17 each month, to protect an unlimited number of your products. Please note, Mac access requires a one-time, $40 set up per product, because it involves additional manual work at our end. If Mac access is not required, then of course you will not need this additional set up at all. Want to protect for iPad, Android and other mobile devices? We guarantee our Advanced System for Mobile will do what you need, with ANY mobile device! CLICK HERE for Mobile Document Security to see how our system looks & works on mobile devices (also with 3-levels of mobile security).